Yup, that's right - the new RM&JHB album "Sharp Knives & Loaded Guns" is out today!! You will be taken to a web-page, exclusive to this CD where you can chek out super-exclusive remixes, b-sides, videos, live-videos, and listen to demos of all the album's songs - but coolest of all: you can download your own RM&JHB Live EP FOR FREE!!! We'll let you download 6 kickass trax from our summertour, you burn the CD, print the artwork and make yourself a proper bootleg - now how cool is that???!! It's not always recognized in today's "we want it all right now" world, but patience is a true virtue. And Bergen's finest electro-rockers Ralph Myerz & the Jack Herren Band are being rewarded for remembering that golden rule. After releasing two highly successful albums on an indie label (2003's 'A Special Album' and 2005's 'Your New Best Friends'), the trio is set to unleash its major label debut on Virgin Records. Paying homage to the glory days of great shows and audience communication, it blows your speakers with a tight and overwhelming light show & pyrotechnics and features the mad drummer/percussionists front stage, a bass/guitar/slide/EFX maestro accompanying the main Ralph himself in the middle, pumping out the catchiest hooks, chilled out moods and rocked out electronica.....or whatever you want to call it. 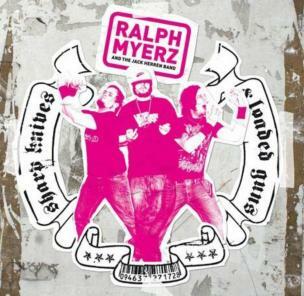 Yes, Ralph Myerz & the Jack Herren Band can rock, as the band has proved over the last 4 years - touring their home grounds and Europe extensively, headlining their own club shows in every corner of the European continent, or making memorable appearances at some of Europe's biggest festivals (be it rock, jazz or electro festivals, these boys will have you rockin!). Wheter they play to a hundred people at a dodgy Hamburg club, opening the main stage at legendary Glastonbury, or appearing as stand-in act for David Bowie in front of a 70.000 capacity crowd at France's biggest rock festival - the Myerz boys will always play a show like it's their last. A bomb set to detonate for one time only. With a fierce hunger to please, the band takes the intensity from 11 to infinity, making sure no-one leaves their show unsatisfied. Never losing focus, always heavy grooving, and taking care of their crowd as if it was their sole purpose here on this earth... Those who have witnessed the sonic assault of the band knows the score and is forever longing for more - those who haven't, you have no idea what's gonna hit you.... then you'll be hooked..........forever!